Today at our parish church, our family, along with many other people, attended one of the loveliest May Crownings we have had the privilege of attending. 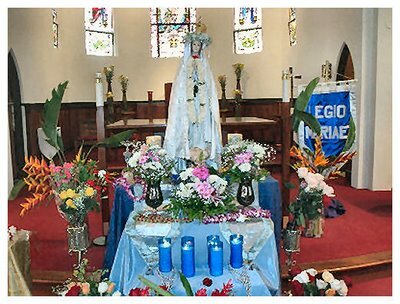 Thanks to the Legion of Mary, we were able to honor our Blessed Mother during the month dedicated to her, in a beautiful and heartwarming way. Our blessed Mother must have been quite pleased with the beautiful music, songs as well as the Holy Rosary in which five decades were led by different groups of adults and children. The ceremony ended with a closing prayer by the Rev. Edwin J. Duffy, who has a great devotion to the Blessed Mother. 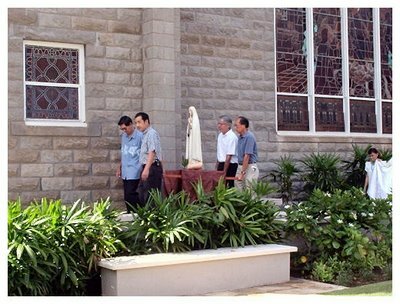 The top photo is the procession into the church with the statue of Our Lady. The bottom photo is the statue of Our Lady after she was crowned with flowers and leis by all the people present. receive Holy Communion on the tongue and not in the hand." suffering of Christ, for the sake of Christ's body, the Church. manner by which we receive Holy Communion. Holy Communion on the tongue and not in the hand. clear that She does not want us receiving Communion in the hand. what is happening in the Blessed Sacrament. need to consider exceedingly carefully. and ask yourself how you intend to approach Our Lord, because He is your Judge. Blessed Lord on the Day of Judgment? must approach Him with the greatest reverence, the greatest respect. need to be very careful. the Presence of Our Lord. say, have allowed it; it is not a sin if you receive Holy Communion in the hand. In some places in the early Church they did that; Saint Justin talks about it. that were occurring. I ask you to really pray about that. is only one conclusion to which you can come. Lord; they are doing what they have been told to do. to consider their actions toward Our Lord. treasures of wisdom and knowledge are contained.